I went on a hike this morning. When my friend emailed our hiking group earlier this week suggesting this trail on the US Air Force property, she said it was a 1.8 mile (one way) hike up to the summit of Eagle Peak, with a 300 foot elevation gain. About 20 minutes on the trail, we realized that she got her numbers mixed up and instead of being a 300 foot elevation gain, it was NINETEEN HUNDRED. 1900 feet spread out over a whopping 1.25 miles. So, basically, it was a vertical ascent, which is what I came home and discovered when I looked up Eagle Peak on the web. Here's one description: "This near-vertical trail from the edge of the Air Force Academy was clearly made by young, hard-body cadets. It climbs relentlessly. There are few spots for a rest. But the 360-degree view at the top, with the spires of the Cadet Chapel on one side and the snowy profile of Pikes Peak on the other, makes this serious quad-burner worth the pain." It wasn't easy by any stretch, but it was gorgeous. The aspen grove near the top (the only flat part of the entire hike!) was breathtaking, and there were Columbine everywhere. 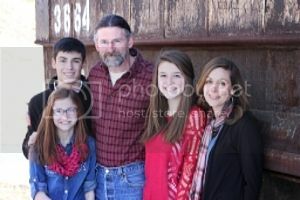 I forgot my camera, but I did take some pictures with my cell phone...I just can't figure out how to download them to my computer, so here's a pic I borrowed from a website I found. The views from the summit were astounding! 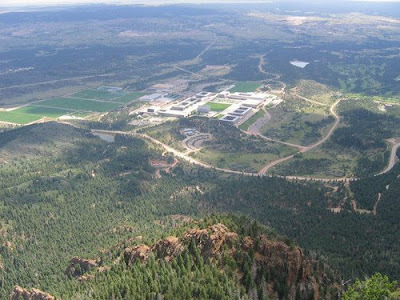 The picture above shows the view looking down from the summit onto the US Air Force Academy. It was very cool here today, and it was COLD at the top. My kids thought it was awesome when I told them that we were actually above the clouds a few times. That didn't help my fear of heights though. Getting down from the summit was almost as difficult as climbing up. I slid twice on the scree (very loose rock/dirt) and scraped up both my hands and I'm pretty sure I'm going to have a nice bruise in the middle of my back from landing on a rock. Ugh. We made it down safely, and walked across the street to the USAFA visitor center and grabbed Subway sandwiches which we ate outside while facing "our mountain". Such sense of pride and accomplishment! My knees took the brunt of the hike today...especially on the descent...so I'm going to make a Motrin cocktail and head to bed shortly. I bet I'll sleep really well tonight! So...some of you have asked about my Pikes Peak ascent. My hiking friends and I are still working towards that goal. Honestly, as we were hiking up Eagle Peak today, we weren't sure we were ready, but my friend figured out today that Pikes Peak is only a 10% grade and what we did today was 23% (major steep!). Also, we climbed 1900 feet in 1.25 miles, while Pikes Peak is a 7,000 foot gain spread out over 13 miles. I think we can do it! I'm feeling pretty empowered after today. Wow...you are brave. The worst part about hiking for me is the descent and the slipping and sliding. I picture myself hurtling headlong off a cliff. :) But the view from the top looks like it was totally worth it. Oh, girl, I KNOW you can do it! Piece of cake after all that. You just wear those scrapes and bruises like the badge of honor that they are. Well, except, you CAN do Pikes Peak. My little cousins did it one year (had a little help from parents). You just have to take your time and take lots of water breaks. Hey, I know exactly what peak you are talking about. The PR guy at the AFA chapel told us about his climb up it...he said it was amazing. Wow, Meredith...that's sounds amazing...I love hiking with my family...we have some great trails in Georgia but I'm sure nothing like that...I think it's great that you know about grade levels and being "spread" out...hope the cocktail was helpful and WAY TO GO!!! Way to go girl! I'll be it was a beautiful hike. A friend of mine (from The Well) just hiked Pike's Peak.... She said it was a "killer" hike, but BEAUTIFUL. Meant to add that your hair is so cute in the new profile pic. I've been meaning to change my photo for months! You can do it! 1900 feet in 1.3 miles...wow. Have you ever been to/heard of Hanging Lake Falls? It's off I-80, I think between Vail and Glenwood Springs. Mike and I hiked/climbed it on a whim, driving once. It climbs 1200 feet in 1.2 miles, and I quit once, but after Mike saw how beautiful it was, he came back and got me to finish. I was so glad it did. It's incredible. I think you can do it! Way to go! I am so proud of you - that's awesome. You can totally do Pike's Peak! Whoa! I am not worthy!! PRaying for those bruises to heal quickly and for Pike's Peak to be such a blessing! I am so impressed! You will forever and ever whoop my bootie in the great outdoors! Mah Hero! By the way, you won at my place! can you believe it? Congrats, Mer! I am impressed- I have hiked in CO only once and it was TOUGH! I bet your legs felt like rubber after all that! I am totally IMPRESSED! You SHOULD be proud! That sounds killer! I wandered in from a few blogs over and liked your blog. The mountain view is beautiful. We just moved back to Colorado, and are looking forward to taking on some beautiful hikes and four wheel drives. The mountains are so beautiful. You don't know how much you miss them, until you've been gone a while. Thanks for sharing. A "hike" here is very flat indeed. Hey, I've climed Pikes Peak, but it was in a Jeep. Does that count? So Proud of you! If you can do that your can TOTALLY make your Pikes Peak goal! That is SOME view! Well done! Love seeing that picture! I'm going to be in C Springs this weekend visiting my son! Can't wait to see the mountains. So very impressed and proud of your hike!I am so excited that you are getting close to your goal. Question - you said there were Columbine everywhere. What is Columbine?